The lightweight and heavy duty furniture dolly is an ideal way to move heavy loads indoors, or on flat ground outdoors. 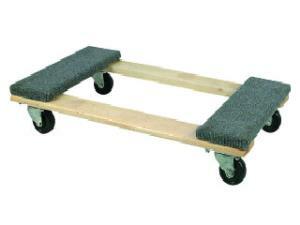 The 18" x 30" dolly can hold a maximum load of 500 lbs each, are made out of wood, and have a built in carry handle. Carpeted ends protect and cushion valuable furnishings. * Please call us for any questions on our furniture dolly rentals in Hillsdale and Ridgewood NJ.